What do caregivers worry about? We're just a phone call or mouse click away. Find help here. Each November, The ALS Association recognizes National Family Caregivers Month, and we pay tribute to the individuals who provide assistance to people with physical, developmental or emotional needs. Caregivers encounter many challenges in dealing with ALS, some of which include the new experience of providing assistance to those developing physical limitations affecting mobility, swallowing, speaking and breathing. Potential cognitive changes that may affect some diagnosed with Lou Gehrig’s Disease can present additional challenges. An ALS diagnosis impacts every aspect of caregivers’ lives as they adjust their efforts to meet ongoing work, family, personal and financial obligations, which change as this disease progresses. To help caregivers cope with the effects ALS has on individuals, The Association will provide various resources throughout November to empower them to address the daily issues they may experience in tending to a person with Lou Gehrig’s Disease. These will include a Webinar on the use of assistive technology to improve a caregiver’s quality of life. Browse the links to the left and below to find all these useful resources. As the only national non-profit organization fighting Lou Gehrig’s Disease through research, advocacy and care services, The Association wants to offer caregivers support this month—and throughout the rest of the year—so that they can provide the best care to their family members or friends with ALS. 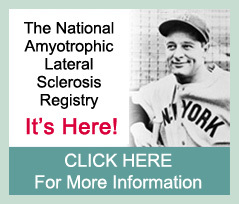 Remember that it is those who are living with Lou Gehrig’s Disease who inspire The Association to continue to strive toward achieving its vision: To create a world without ALS. Family Caregivers Unite! – VoiceAmerica radio interview featuring Rocky Mountain Chapter Care Services Director Leslie Ryan and ALS caregiver Christine Hanks. The program can he heard online at http://ow.ly/preTP.